find the moon in a waxing gibbous phase this evening – more than half lighted but less than full – in the sky from sunset until after midnight. Tonight’s moon will be visible near a bright object in our sky. It’s not a star, but a planet – Saturn, planet of the rings. Given clear skies, almost everyone around the world can see the moon and Saturn near each other this evening. Earth passed between Saturn and the sun on March 22 of this year. That was Saturn’s yearly opposition, and it means that we’re farther from Saturn now than we were two months ago. We’re now racing ahead of Saturn in Earth’s smaller, faster orbit around the sun. So Saturn is steadily appearing dimmer on our sky’s dome, and it’s in our sky for fewer hours of each night. 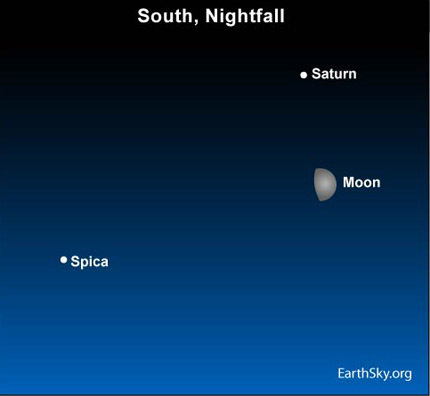 There’s a bright star near the moon and Saturn, too, tonight. It’s Spica, the brightest light in the constellation Virgo the Maiden. 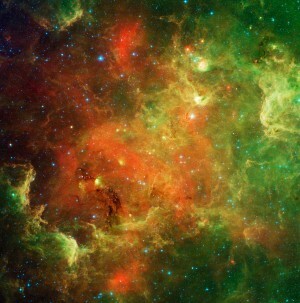 Spica is the 15th brightest star in all the heavens. Like all planets, Saturn will be shining with a steadier light than the twinkling stars, and it’ll be the closer bright light to the moon tonight. In contrast to the moon, Saturn moves at a snail’s pace across the dome of night. By tomorrow night, the moon will have moved on, pursuing its endless orbit around Earth. Site contents copyright © 2019 Recorder Online	except as noted. All rights reserved. | 88 queries in 2.131 seconds.